The other night Superking and I were at the grocery store looking for something to bring home for dinner that night. Pizza? I don't know. Tacos? We just had that last night. Fish? We already have that 3 nights a week! So what to do? And then we see it...a lady handing out free samples of salami. We have a taste. Yumm! We're hooked! Let's make a charcuterie platter!! Who says charcuterie and cheese plates are only served at fancy restaurants and only as appetizers?! 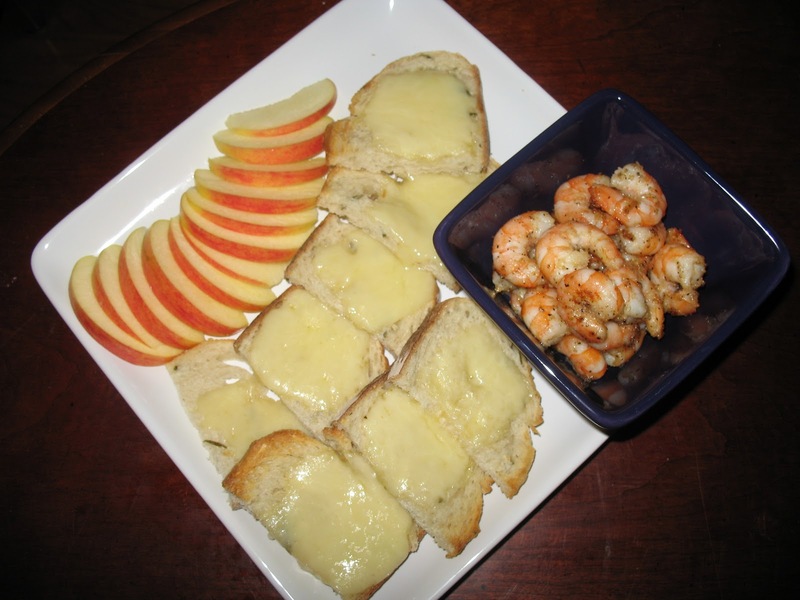 We've had cheese plates several times for dinner. And we're not the least bit ashamed! 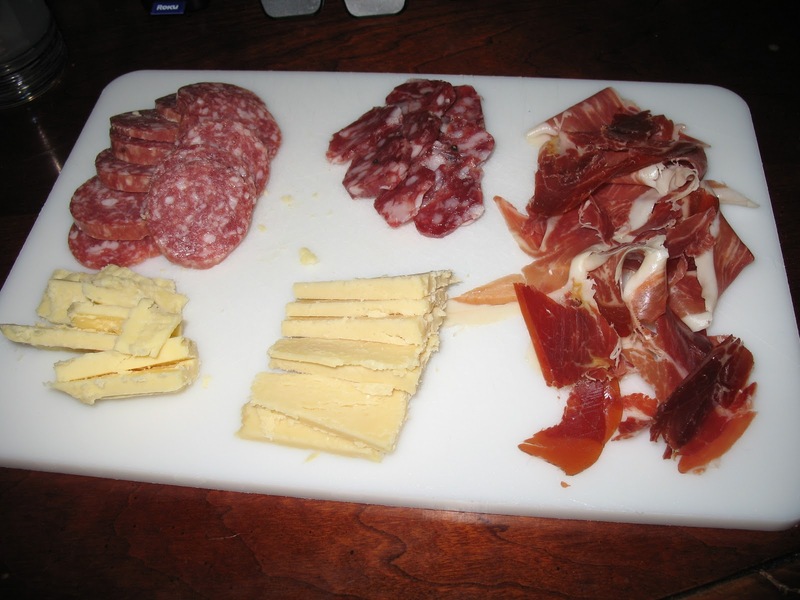 Both cheese plates and charcuterie plates can be as simple or as elaborate as you want them to be. And they can accomodate most any price range too. First of all, let's talk charcuterie. Some of you may be wondering exactly what that is. Well, let me tell you, if you like meat, you'll LOVE charcuterie. 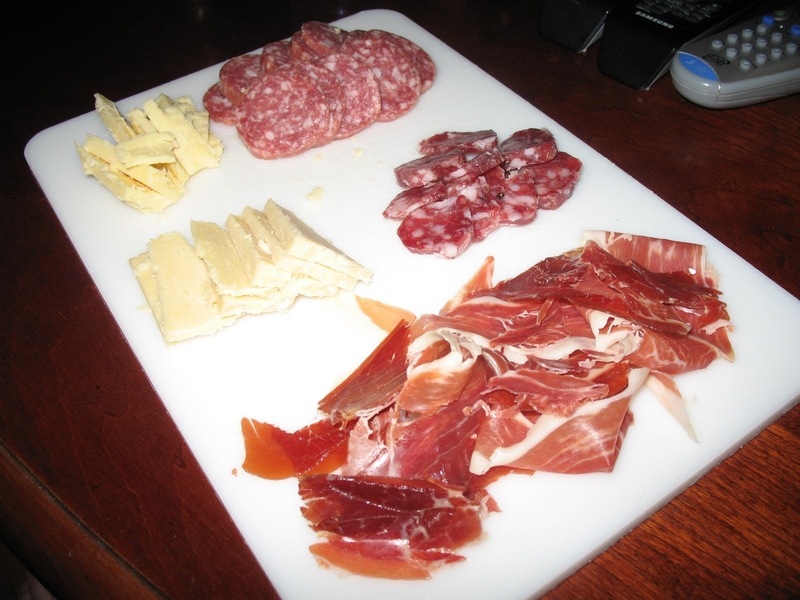 The word itself is from the Italian word for "cooked meat" and a charcuterie platter generally consists of various cooked and dried meats, sausages, salamis, hams, etc. Most often it can be served alongside a cheese plate or on its own and the meats are usually accompanied by a variety of savory side items such as crusty bread, olives, pate, and maybe a spicy grainy mustard. For our charcuterie plate, we chose three meats...a pinot noir wine salami, a black truffle pork salami, and jamon iberico, which is a really thinly sliced dry cured slightly spicy ham. All three had their own unique savory flavor. We also paired our meats with some leftover Irish cheeses from our St. Patty's Day feast, some cooked shrimp, cheesy rosemary bread, and crunchy apples to add a little sweetness. This is a dish I like to make for parties and sometimes just for me and Superking. 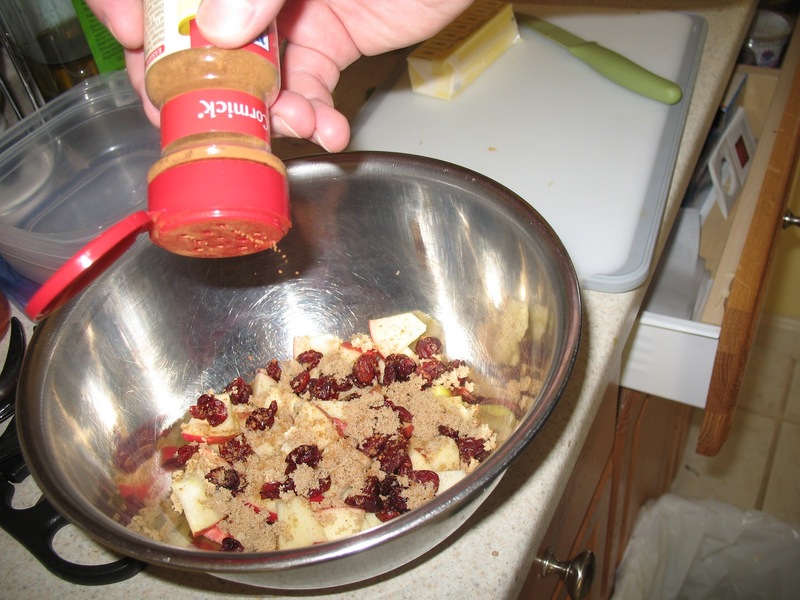 Its simple yet looks beautiful, is filling, and very versatile for any occasion or time of year. 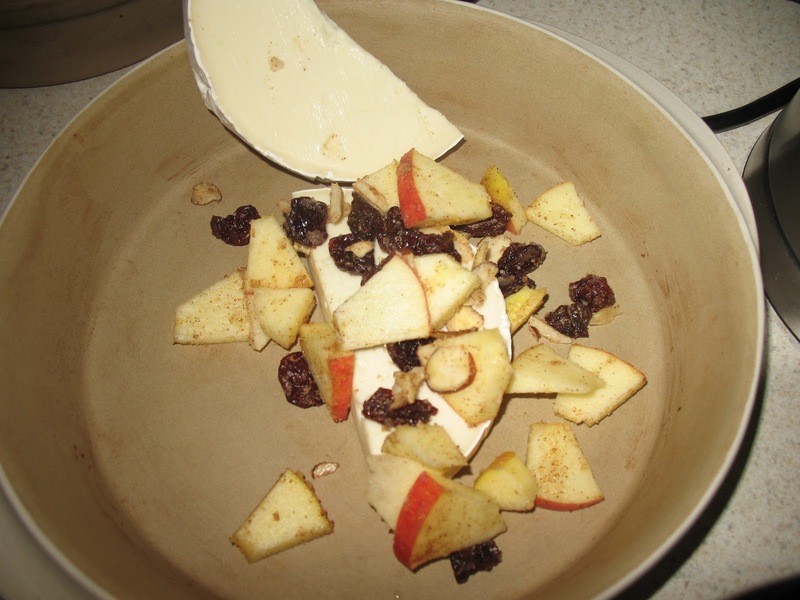 Baked Brie. I usually use a Pampered Chef recipe for this and most often I make the sweet version with apples, cranberries or cherries, almonds, cinnamon, and sugar. 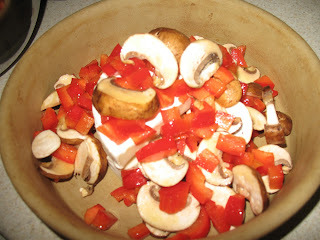 This time I also wanted to do a savory one with mushrooms, red peppers, and olive oil. 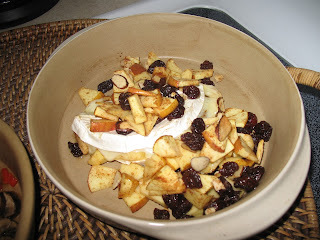 The sweet apple brie I serve with fresh sliced apples, some crackers, possibly other fruits like grapes. 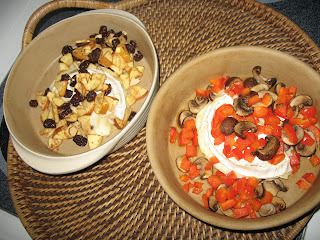 The savory one I would serve with warm crusty bread, some fresh cut veggies, or some lovely charcuterie! There are no rules! 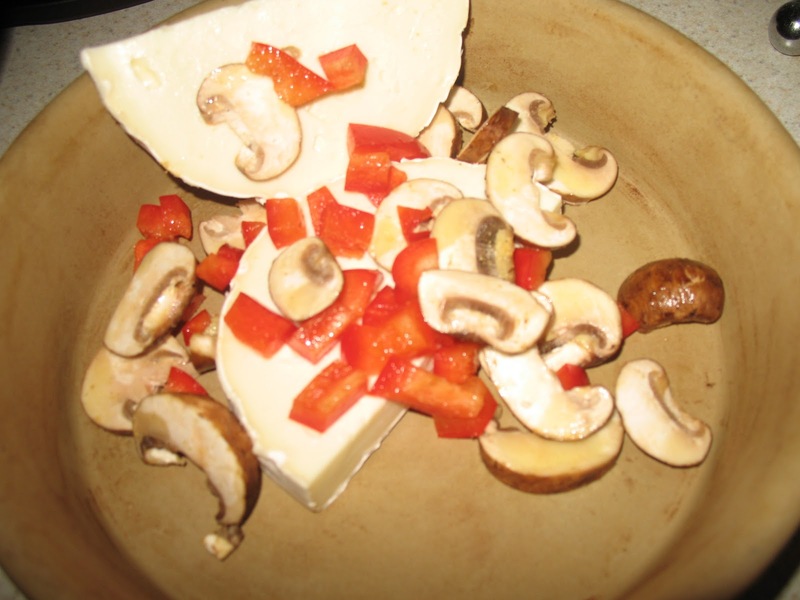 Serve cheese and/or charcuterie as an appetizer, a dessert, a side dish, or even dinner! 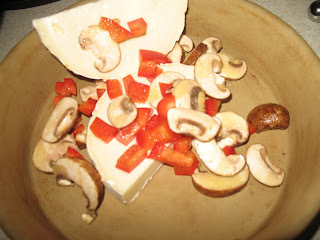 Pick 3-4 cheeses (if you pick too many you'll overwhelm your palette) that are of varying degrees of texture and pungency. 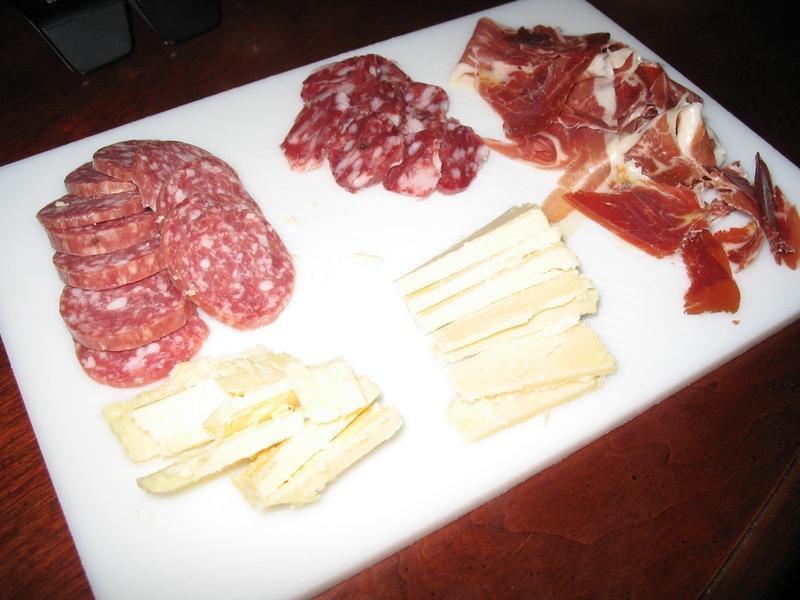 Pick 3-4 meats of varying flavors and textures. Accompany them with sweet fruits (dried or fresh), salty nuts, crusty breads or crackers, fresh veggies, juicy olives. Whatever you like! Savor and Enjoy! We did this while in Hawaii one night! We (meaning Lisa) found a shop called Who Cut The Cheese and it was full of cheese, wine and cured meats. 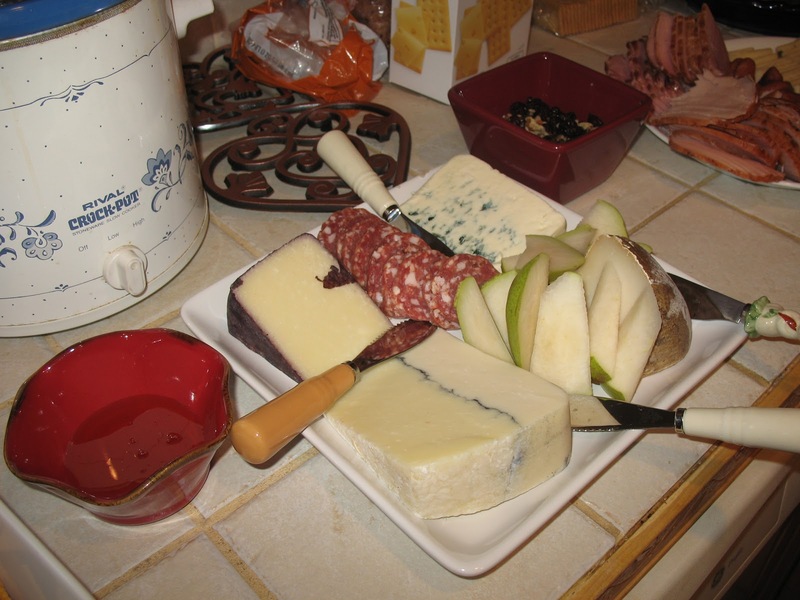 We got A LOT of cheese and meats, and we discovered a cheese called Red Dragon which is a Welsh cheddar full of mustard seeds and ale -- DELICIOUS, you must try it. I just found it recently at Whole Foods (FFX). seriously not all ham is created equal. the garbage you find at your average grocery store is not worthy to be compared with ham made from iberian black pigs. or prescuitto (which i likely mizspeled).